Energy crop production for biogas still relies mainly on maize, but the co-digestion of alternative energy crops (legumes, amaranth, ryegrass, flower mixtures) with maize can have several advantages. First, a greater biodiversity in the fields; second, an enrichment of essential trace elements in biogas substrates (cobalt, nickel, manganese, and molybdenum); and third, less use of artificial trace element additives. In two randomized field trials, 12 different variants of field crops in sole, double and intercropping were tested over a 2-year period. Dry matter yield, trace element content of the crops, and soil parameters like soil texture, pH, and soil element concentration were determined. The trace element concentrations in biogas plants resulting from input mixtures of energy crops (legumes, amaranth, faba bean, and ryegrass) and maize are calculated. High dry matter yields were obtained for ryegrass, maize, winter faba bean maize, intercropping winter faba bean/triticale-maize, and intercropping rye/vetch-maize. The double croppings with maize reached highest total yields (ca. 30 t DM ha−1). Total element deliveries from the harvest reveal large differences between the variants and the trace elements. Cobalt is provided most by summer faba bean maize and intercropping of winter faba bean/triticale-maize. Ryegrass can deliver the greatest amounts of Manganese and Molybdenum to biogas plants. When these energy crops are added to conventional maize input for biogas production, the trace element concentration in the fermenter can be raised significantly, e.g., 0.03 g Co t−1 FM can be attained compared to 0.003 g t−1 with maize silage input only. Sufficient Co can be provided by addition of manure to the input mixture. Alternative energy crops in combination with maize ensure a good dry matter yield per year and provide significantly more trace elements. However, these substrate mixtures alone do not provide enough trace elements, particularly Co. However, enough Co can be supplied by a small addition of manure. Renewable electricity production from biogas is a promising renewable energy form which can mitigate climate change and decrease the dependence on fossil fuels. In Germany, there are 9300 biogas plants with a total installed electric output of 4.5 GW . Energy crop production for farmers offers many advantages, e.g., more stable delivery contracts for biogas substrates leading to stabilization of the revenues, the production of organic fertilizer in the form of biogas residue and a larger biodiversity on the fields . In Germany, maize is the most commonly used energy crop with 72%, followed by grass (12%) and 7% of cereal whole crop silage . Maize is used because of its very high dry matter and methane yield, and can be easily stored as silage for biogas fermenters. There are some negative traits about long-term maize cultivation, because it leads to soil degradation and decrease in soil organic matter. A 27-year field experiment showed that soil organic carbon decreased by 30% for continuous maize growth compared to only 3% for a permanent grass cover . Palmer and Smith  stated high to severe levels of soil structural degradation on sites where late harvested crops such as maize had been grown. When maize is grown in monoculture, it may also promote pests like the European corn borer (Ostrinia nubilalis) . Low trace element (TE) contents in biogas fermenters cause instabilities and low biogas production rates. Cobalt (Co) in particular is a limiting factor for growth and activity of methanogenic microorganisms [7–11]. Alongside Co, nickel (Ni), molybdenum (Mo), manganese (Mn), selenium (Se), and tungsten (W) are essential trace elements for biogas microorganisms . Some authors give minimum thresholds for trace elements in biogas fermenters which should be surpassed to guarantee a stable biogas production. For Co, for example, Sauer  evaluated 0.07 mg kg−1 FM and Pobeheim  0.05 mg kg−1 FM. These thresholds depend on different fermenter parameters like the organic loading rate (OLR), the hydraulic retention time (HRT), and the biocenosis. To avoid negative effects due to too low trace element supply there are two ways to conquer deficiencies. The elements can be supplied by addition of manure which has a high TE content or by addition of trace element additives. The application of high amounts of liquid manure however has the disadvantage that it mainly consists of water (about 6–8% DM) occupying space in the biogas fermenter without contributing to the biogas yield . Trace element additives are commonly used in more than 3.000 biogas plants in Germany. This number is a sound estimation by biogas scientists and is also given by executive staff of a biogas additive selling company. It is safe to assume that about every second biogas plant in Germany uses these kinds of trace element additives. In 2015, there were about 250 different biogas additives on the market . This handling often stabilizes biogas production [11, 15] but bears environmental and health risks for operators and is expensive. The natural element cycle is disturbed with potential toxic (heavy) metals (Co, Ni, Mn, Mo) as these elements become enriched in the biogas residue used as an organic fertilizer . Furthermore, the majority of Co production is located in the Democratic Republic of Congo, where labor conditions are questionable. A recently published report state human rights abuses by child labor and health problems of the workers . For all these reasons, the application of element additives should be minimized. This study uses the approach of providing these trace elements with alternative energy crops to avoid or at least minimize the use of trace element additives. Different plant species have differing element uptake mechanisms and tissue structures resulting in different trace element concentrations in the plant matter. The trace elements Ni, Mn, and Mo are considered essential to higher plants but are needed only in small amounts . Cobalt is reported as beneficial to plants [19–21] especially for Leguminosae, since Reisenauer  demonstrated the essential role of Co in biological nitrogen fixation (BNF). Mn in plants is part of a large number of enzymes and is involved in redox processes in oxidation states II, III, and IV. It plays an important role in photosynthesis, first demonstrated for green algae chlorella . Mo is an essential element for plants as well and is part of several enzymes [21, 24, 25]. The greatest concentrations of Mo were found in Leguminosae where it is mainly located between the leaf veins . Ni belongs to the enzyme urease needed for the hydrolysis of urea . Ni-deficiency leads to leaflet tip necrosis caused by urea . All these trace elements can also be toxic to plants, but such high soil concentrations necessary will not be reached except in areas of non-ferrous mineral deposits or contaminated areas. In fact, it is more likely that deficiencies occur as partially stated for the European agricultural soil . Co, Ni, and Mn do have in common a higher uptake by plants at lower soil pH. On the other hand, Mo is less mobile in acidic soil conditions . This study shows results of an interdisciplinary project which combines agronomic, (geo-)chemical and microbiological methods for an optimized and more sustainable biogas production with energy crops. Several alternative energy crops (e.g., legumes, amaranth or flowering plants) were tested in comparison to traditional energy crops (e.g., maize, ryegrass) in different cropping systems. This study comprises the first part of the project results: the soil properties, the element composition, dry matter yield of the energy crops and the combined results as flux of element (g ha−1 a−1). The trace element concentrations provided here are valuable because there is very limited data on Co, Mn, Mo and Ni concentrations in whole plants available, especially for Co. These results together are the basis for hypothetical calculations of resulting element concentrations in biogas plants that arise from different input mixtures. This data is also required in the second stage of the project where the energy crop mixtures are tested in lab-scale biogas plants. The aim of the study is to give arguments for a broader energy crop as input into biogas plants. Raise transparency and awareness of the use (and misuse) of trace element additives for biogas production. 2-year field trials were conducted at two contrasting sites in southern Lower Saxony, Germany. At the research farm Reinshof in the Leine valley (N 5°29′23.41′′ E 9°56′11.95′′; altitude 164 m) and at Sömmerling in the Solling region (N 51°38′26.37′′; E 9°40′15.46′′; altitude 251 m). The soil at the fertile site Reinshof is classified as a haplic luvisol and at the marginal site Sömmerling as a cleyic cambisol. Available field capacity in the rooting depth at Reinshof and Sömmerling is 257 mm and 124 mm, respectively. Long-term annual mean temperature is 9.2 °C at Reinshof and 9.0 °C at Sömmerling and the long-term annual precipitation 651 mm and 836 mm, respectively . The pH of the soil (0.01 mol l−1 CaCl2 ) is 6.8 at Reinshof and 6.4 at Sömmerling. The parent materials of the Reinshof soil are fluviatile sediments derived from late quaternary loess and that of the Sömmerling are triassic sand- and siltstones with an addition of some loess. Further, important topsoil parameters are shown in Table 1. The extractable amounts of phosphorous (P) and potassium (K) were measured in calcium acetate lactate solution (CAL) and magnesium (Mg) measured in CaCl2 . The soil particle size was analyzed by hydrometer analysis . The experimental design was a randomized Semi-Latin square with four replications. The area of each plot was 9 m × 7.5 m (67.5 m2) at Reinshof and 4.5 m × 7.5 m (33.75 m2) at Sömmerling. The plants were grown in 2014/2015 and 2015/2016, hereafter referred to as 2015 and 2016. Various farming systems were performed. The double cropping system is defined as a crop rotation with a first crop in winter and a succeeding second crop in summer. As winter crops winter faba bean, winter triticale, an intercropping of winter faba bean and winter triticale and an intercropping of rye and hairy vetch were grown. Maize was used as summer crop in this double croppings system. In contrast to this, the summer main crops summer faba bean, annual flower mixture (12 species), amaranth, maize, and the intercropping of amaranth and maize were grown after bare fallow over winter. Ryegrass, perennial flower mixture (25 species), and cup plant were grown as permanent crops for duration of the trial. Cup plant could only be harvested once in 2016, as in planting year 2015 it formed only leaf rosettes. In the 2 years of field trials, different maize cultivars as second crops were used, because the cultivar used in 2015 did not reach full maturity. Standard crop management practices for fertilization and plant protection were applied. Nitrogen (N) fertilizer was applied relating to the default nominal value of N . For unknown crops, the amount of N fertilizer was determined by recommendations of breeders and other study results. In any case, the amount of mineral N in the soil (Nmin) was taken into account and subtracted from the nominal value. The fertilizer was applied as a combination of organic and mineral fertilizer. See Table 2 for additional cultivation parameters. The previous crop at Reinshof was winter wheat in both years. At Sömmerling, it was rapeseed in the first year and winter wheat in the second year. After the previous crop, the soil was plowed in the first and reduced cultivated in the second year. Seed-bed cultivation took place before sowing in autumn and spring, depending on variant. The winter crops as well as ryegrass were sown after stubble cultivation and ploughing in the first year. In the second year, only a reduced tillage after the previous crop was performed. The perennial crops in the first year and the summer main crops in both years were grown after seed-bed cultivation in spring. The seeds of the partners of the intercropping variants were sown in alternating rows. The sampling and analysis of dry matter yield at Reinshof and Sömmerling were performed between June and October 2015 and between June and November 2016 (Table 2). All variants except ryegrass were harvested once a year. Due to problems in establishing ryegrass at Sömmerling in autumn 2014, the results are only shown for three cuts of ryegrass in 2016. At Reinshof, there were three cuts in both years. To determine dry matter yield a sample of 1 m × 1 m was harvested for all variants except for maize. Plants were cut close to soil surface by hand. For maize, a sample of 1.5 m × 1 m cut at approximately 7 cm above soil surface was harvested. The plant material was dried at 105°C for 48 h. All variants were harvested at silage maturity, which is suitable for use in biogas production. Unfortunately, on site Reinshof in 2016, maize as second crop was lost in the variants triticale, intercropping of faba bean/triticale, and rye/vetch. Therefore, the yield of this second maize was estimated from the plots of second maize of the variant winter faba bean. All plant samples for trace element analysis were collected as whole plants (aboveground plant parts without roots) on the harvest dates listed in Table 2. The soil samples were taken up to a depth of 30 cm in April 2015. The samples were air dried and sieved to < 2 mm in grain size. A minimum of 100 g of the soils and 500 g of the plant fresh matter were dried at 105 °C. The soils were ground in an agate ball mill (Fritsch Pulverisette 5) to < 0.063 μm, and the plants were cut in a universal cutting mill (Fritsch Pulverisette 19) to < 0.5 mm. Aliquots of 150 mg of soil and 700 mg of plant powder were completely digested with a mixture of ultra-pure concentrated HNO3, HClO4, and HF in closed ultra-clean PTFE vessels (PicoTrace, Bovenden, Acid sample digestion system, DAS 30). For the soil samples, a small amount of HCl was added to completely dissolve precipitated aluminum and iron oxide hydroxides. The soil solutions were diluted to 100 ml, the plant solutions to 50 ml before measurement. In addition, blank solutions without sample material were added in the digestion process to ensure that the handling was clean without detectable contamination from the reagents, the digestion, and the measurement process. In the resulting clear sample solutions, 47 elements were quantified by Inductively Coupled Plasma Optical Emission Spectrometry (ICP-OES, Agilent 5100 VDV) and mass spectrometry (ICP-MS, Thermo Scientific iCAP Q). The limit of detection was calculated by the 3-fold standard deviation of the blank concentrations for each analysis batch. The precision and accuracy of the digestion process and the ICP devices were tested by analyzing several international reference samples and one in-house standard. The accuracy describes the deviation between measured and reference value. In general, for the main elements, the accuracy was between 5 and 10%. For the trace elements, typical average accuracies were between 10 and 20%. A total digestion process of the plant samples was performed. To access physiological concentrations resulting only from plant uptake, the values were corrected for adhering dust and soil particles. For plants grown on open field, a small amount of adhering soil or dust particles cannot be avoided. Severe soil “contamination” was washed off before further sample preparation. The concentrations were corrected with the median transfer factor (TF = conc. in plant/conc. in soil) of several elements with a very small translocation into the plant. For a detailed description refer to Method 3 in Pospiech et al. . All element plant concentrations in this work were corrected this way. This was most important for Co and Ni. The concentrations of Mn and Mo remain mostly unchanged by the correction, owing to their larger TF. Statistical tests were performed to test, whether the difference in yield or the differences in element delivery were significantly different. The statistical method used was a linear mixed-effects model to account for the design and the treatment effect (variant). Effects for year and site were assumed to be fixed. Blocks were treated as random. The statistical analysis was done with R, Version: 3.4.2  and the packages lme4  and multcomp . The graphical representations with the package ggplot2 . The significance level was set at 5%, and if significant results were found, Tukey’s HSD test (honestly significant difference) was performed to obtain pairwise mean comparisons. Significant effects of variant, year, site, and significant interactions of variant × year and variant × site were detected for yield (Table 3). Therefore, pairwise mean comparisons of crop species were conducted separately for each year and each site (Fig. 1). The crops at site Reinshof generally reached greater yields than the crops at Sömmerling. This was most likely the result of the better soil texture, soil quality, and available field capacity of the soil at the site Reinshof. The greatest yields at both sites and years were reached for the double cropping system of triticale-maize, intercropping faba bean/triticale-maize, and intercropping rye/vetch-maize. In 2015, about 25 t DM ha−1 and in 2016 about 30 t DM ha−1 were harvested for these variants at site Reinshof. First crops contributed considerably to the total dry matter yield with percentages between 49% (winter faba bean) and 57% (rye/vetch) in 2015 and 32% (winter faba bean) and 57% (triticale) in 2016. This is consistent with Graß et al. who also states high dry matter yields in double cropping systems. Like in this study, they found highest yields in variants with cereal-based first crops. 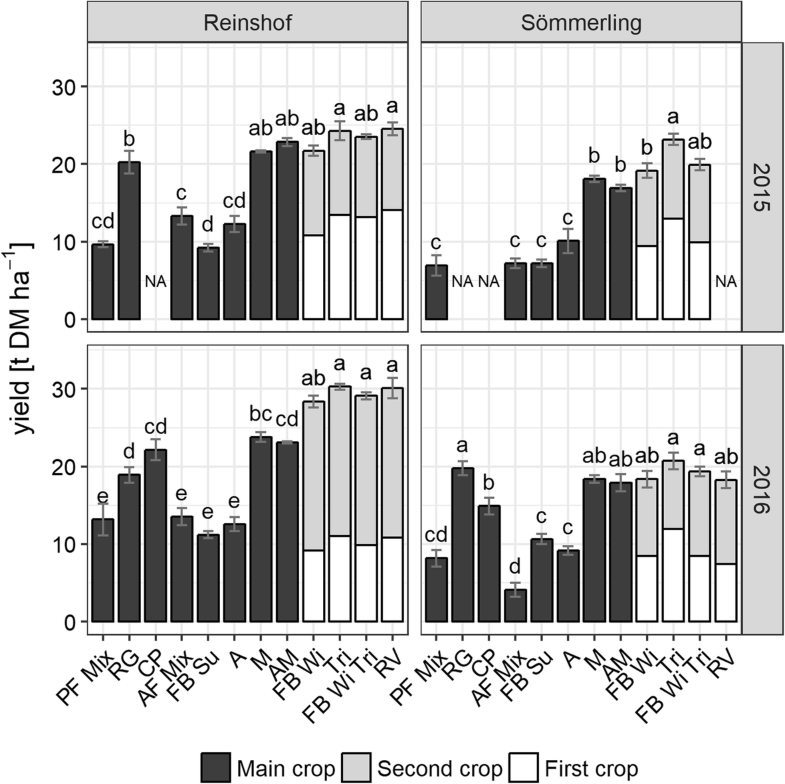 Maize as sole crop and the intercropping of amaranth/maize reached high dry matter yields with 22 to 24 t DM ha−1 at Reinshof, and slightly smaller yields on site Sömmerling. Though the proportion of amaranth in this intercropping was very small (about 2% amaranth, 98% maize, data not shown), because maize suppressed amaranth during growth in this kind of sowing method. The differences in yield between the variants of the double cropping system and maize were mostly insignificant, apart from Reinshof in 2016. In 2015, only triticale-maize at Sömmerling had significantly greater yield than maize as main crop. In 2016, the double cropping of triticale-maize, intercropping faba bean/triticale-maize, and the intercropping rye/vetch-maize at Reinshof, had significantly greater yields than maize as main crop. Ryegrass also reached good results in both years on both sites (20–22 t DM ha−1). Interestingly, at Sömmerling ryegrass showed greater yield figures even if it is not statistically significant greater than maize and a comparable yield to the highest yielding variants at this site. As in this case, in 2015 at site Reinshof, the yield of ryegrass was not significantly different with that of maize. The flowering mixtures (annual and perennial) could not compete with the high yielding crops and achieved only less than half of the maximum yields at each site and year. A slight yield increase from the first to the second year could be observed for the perennial flower mixture. In recent years, perennial wild plant mixtures for biogas use gained increasing attention in Germany because of their numerous ecological benefits such as permanent soil coverage, enhanced biodiversity, or a habitat function for various species. Dry matter yields between 3 and 23 t DM ha−1 depending on the kind of wild plant mixture, year of use as a permanent crop, and site were reported in the literature . With a maximum yield of 13 t DM ha−1 at Reinshof in the second year, the yield potential of a wild plant mixture was most probably not reached, but may increase in later years of cultivation. At Reinshof, cup plant achieved a high dry matter yield of about 22 t DM ha−1 and did not differ significantly from the yield of main crop maize. This level of yield could not be achieved by cup plant in Sömmerling; on this site, the plants showed signs of water deficiency. A greater drought-related above-ground dry matter reduction for cup plant than for other crops was also observed by . Yield figures comparable to maize could only be attained at sites with a good water supply. Under Bavarian cultivation conditions about 16 to 22 t DM ha−1 were measured for several years . The trace element concentrations of the plant variants are shown in Table 4. The main result was that the crops mainly used as substrates for biogas production in the field trial: maize and triticale, showed the lowest concentrations of Co, Ni, and Mn. Different element concentrations of the plants between both field trial sites were detected, showing an influence of the different soil properties on element uptake. Also, the statistic test on influence of the site for the delivery rates state a significant effect of the field site. However, the order of element concentrations between the variants was similar on each site, showing that the plant species itself did have a great influence on element accumulation from soil to plant. The greatest Co concentrations of 0.19 mg kg−1 DM (Reinshof) and 0.27 mg kg−1 DM (Sömmerling) were analyzed in the legumes summer faba bean, and in winter faba bean (0.13 to 0.15 mg kg−1 DM) (Table 4). The greatest Ni concentrations were also found in faba bean plants: 0.93 mg kg−1 Ni (Reinshof) and 0.53 mg kg−1 (Sömmerling) for summer variety and 0.67 mg kg−1 (Reinshof) and 0.35 mg kg−1 (Sömmerling) for winter variety of faba bean. These findings correspond to literature which also reports that Mo is essential for Leguminosae [24, 25]. The greatest concentrations of Mn were analyzed in ryegrass (64.5 mg kg−1 (Reinshof) and 77.6 mg kg−1 (Sömmerling). Second highest ranged amaranth samples with 47 mg Mn kg−1 and summer faba bean with 44 mg Mn kg−1 (average of both sites). Most plant variants belonging to the Poaceae family (maize, rye, triticale) reveal small Co and Ni trace element concentrations of about 0.01 mg Co kg−1 DM and about 0.1 mg Ni kg−1 DM at both sites (Table 4). Co and Ni concentrations were particularly low in maize, triticale, and in the intercroppings rye/vetch and amaranth/maize ranging between 0.008 and 0.01 mg/kg for Co and 0.08 and 0.17 mg/kg DM for Ni. Ryegrass plants show the highest Co and Ni concentrations from all plants of the sweet grass family (Poaceae) with 0.02 (Reinshof) and 0.034 mg Co kg−1 (Sömmerling) and 0.71 (Reinshof) and 0.42 mg Ni kg−1 (Sömmerling). The concentrations of Co, Ni, and Mn in intercropping rye/vetch only range slightly above triticale or maize (Table 4), although vetch plants alone did have elevated Ni and Co concentrations (data not shown). This was because vetch only reached less than 5% of total DM yield of the intercropping (data not shown). The same was true for amaranth/maize where amaranth had less than 5% of total DM yield. Only the intercropping faba bean/triticale had almost equal yield contributions of both plants, resulting also in medium concentrations between both plants as sole crops (especially for Co). The flowering mixtures (annual and perennial) also show elevated trace elements, for example, 0.059 mg Co kg−1 (Reinshof) and 0.36 mg Ni kg−1 (Sömmerling). Although these consisted of several plant species they show a narrow standard deviation. with yield (y) and element concentration (conc) in the crop. In Fig. 2 TE delivery is shown as bar charts. There are large variations in total amount of TE delivery, corresponding to the concentration of the elements in the plants and their DM yields. The total amount increases in the sequence Co<Ni<Mo<Mn. For Co and Ni, only small total amounts were harvested in the range of 0.5 and 3 g ha−1 a−1. The largest amount of Co could be realized by sole cropping of summer faba beans (about 2 g ha−1 a−1) or double cropping of winter faba bean-maize (1.5 g ha−1 a−1) and the intercropping of winter faba bean/triticale-maize (1.25 g ha−1 a−1). The first crops contribute about 90–95% of total Co delivery and maize as second crop only about 5–10%. Amaranth results vary between the sites: 1.1 (2015) and 1.35 g Co ha−1 (2016) at Sömmerling, compared to 0.6 g Co ha−1 at site Reinshof in both years of cultivation. Absolute Mn delivery rates are by far the greatest for all four elements. The pattern resembles that of Mo with highest rates for ryegrass (1.5 kg Mn ha−1 a−1) at Sömmerling. The other variants show similar trends for the years according to the results of Tukey’s test. Ryegrass had the greatest delivery rate of Mo (40 to 60 g Mo ha−1 a−1, Reinshof). The greatest delivery rates of Ni were by ryegrass and winter faba bean-maize and summer faba bean (11–14 g Ni ha−1 a−1) at site Reinshof; at site Sömmerling, only rates smaller than 7.5 g Ni ha−1 a−1 could be achieved. Based on element concentrations of energy crops evaluated in the field trials, hypothetical trace element concentrations in biogas fermenters can be calculated for substrate mixtures. For the calculations, we assume an average-sized stirred mesophilic biogas plant (CSTR) of 500 kW (electric) and a daily fresh weight input of 20 t of silage. The hydraulic retention time (HRT) is assumed to be 60 days. Each plant substrate faces volume loss according to the conversion of carbon to biogas. An input of 1 t maize (FM) substrate results in only 0.76 t of biogas residue after biogas production. This can be expressed in a mass reduction or degradation factor (F) of 0.76. Liquid manure only has a 2% mass reduction, giving a mass reduction factor of 0.98 . For the calculations, the following reduction factors (F) for the substrates were used: maize 0.76; faba bean and amaranth 0.8; ryegrass 0.75; and manure 0.98 (compiled from [44–46]). The other mixtures and TE were calculated in the same way. Note that the plant substrate concentrations were converted to g t−1 based on fresh weight (FM). The calculation of trace element concentration in biogas plants follows the principles in Reinhold et al. in which a calculation of main nutrient element concentration in fermentation residues is described. This principle also holds for trace elements as all concentrations of the remaining elements are being enriched in the biogas residue. The mixtures were calculated using the mean concentrations of summer faba bean, ryegrass, and amaranth of both locations. Liquid manure is assumed to contain 8% DM and the following element concentrations: Co: 2.25, Ni: 9.1, Mn: 434, Mo: 4.3 mg kg−1 DM (from own data). Because Co is often the most limiting (from total element concentrations in the plants), the arguments are given in respect to Co threshold values only. The first mixture shows the resulting concentrations in a biogas plant for a pure maize input (Table 5). Mixtures 1–3 consist only of plants and mixture 4 contains 25% of liquid manure. The input proportions were calculated based on a daily total fresh matter input of 20 t. The pure maize input results in poor Co concentrations of only 0.003 mg kg−1 FM. This is less than 5% of the Co threshold of 0.07 mg kg−1 FM. Other authors also report critical shortage of elements (especially Co) in pure maize-fed biogas fermenters [7–9] which are usually stabilized by trace element additives. An input mixture of 40% maize and 60% faba bean (mix 3) resulted in 0.032 mg kg−1 FM giving the greatest Co content in plant based mixtures. This was almost half the threshold of 0.07 mg kg−1 FM (Table 5, mix 1–3). With a small input of liquid manure (25% based on FM) plus maize and faba bean, the Co threshold can be surpassed with 0.073 mg kg−1 FM (Table 5, mix 4). The calculated concentrations in a biogas fermenter show that with the addition of alternative energy crops (faba bean, amaranth, ryegrass), a significant portion of Co and other trace elements can be provided. These conclusions are based on the premise that trace elements in the plants are at least as available as trace elements from element additives. However, this aspect is difficult to analyze, as the fermenter contains an anaerobic, reducing environment with numerous possible ligands and binding partners for the elements. All of the regarded trace elements (except Mn) do have a high affinity for sulfur and may form sulfides, but this also applies for elements in trace element additives. Some aspects had to be left aside for this simplified calculation. For example, the pure plant mixtures calculated in this study would mean a high DM content in the fermenter. Maybe water needed to be added or part of the liquid fraction of the digestate to be recirculated that the stirring units can operate. This handling would also affect the TE content in the fermenter but cannot be included in the calculations. On the other hand, there can be additional positive factors by the input of alternative energy plants to the biocenosis, the microbial growth, and productivity. A microbial community fed by diverse input mixtures is generally less affected by trace element deficiency [9, 47]. Additional research including lab-scale and full-scale biogas plants is required, favorable with assessment of the changes in the microbial community and their activity. A promising outcome of this study was that faba bean, amaranth, and ryegrass have a much greater concentration of essential trace elements for biogas production than maize, triticale, or winter rye intercropped with vetch. Especially Co deficiency in biogas plants is likely caused by the low input of Co by the plant substrates. Our field studies showed that faba bean (sole and intercropped with triticale) in a double cropping system with maize can deliver a high DM yield per year and can provide a significant input of Co, Ni, and Mn to biogas plants. Furthermore, ryegrass is also a good supplier of Ni, Mo, and Mn. An input substrate mixture of faba bean, ryegrass, and maize together with a small addition of liquid manure may provide sufficient Co for biogas plants. Flowering mixtures contain elevated trace element concentrations but their DM-yields are too small. The results of this study reveal the potential of providing trace elements to biogas production in a natural way, without trace element additives. Promoting alternative energy crops will enrich the biodiversity on the field and improve soil quality. This is a very good chance to minimize the use of artificial element additives as they disturb the natural element cycle by remaining in the biogas residue which is reapplied to the fields as fertilizer. In this way, this study is unique in the field of trace element research in biogas production. The majority of studies aim on improving trace element additives and do not focus on natural inputs by plants and small additions of animal manure. The authors thank T. Seibold for management of the field work. We thank Prof. R. Rauber and Dr. C. Meinen for helpful comments on the manuscript. The investigations were carried out within the joint research project: trace elements by energy crops—mass fluxes and recommendations for an optimized process biology in biogas plants. Project partners are the German Biomass Research Centre—DBFZ and the Helmholtz Centre for Environmental Research—UFZ. The research was funded by the BMEL (German Federal Ministry of Food and Agriculture, Berlin) via the FNR (Agency for Renewable Resources, Gülzow, Germany (FKZ: 22019014, 22014813). All data needed for the results and final conclusions is included. WF wrote the manuscript (65%), took soil and plant samples, did the element analysis, and performed the statistics. KH supervised the field experiment (crop management, soil sampling, plant sampling) and did yield and data analysis, performed the statistics, and wrote the manuscript (35%). BS is the project manager, did the acquisition of funding, and improved the manuscript. HR contributed in the acquisition of funding and improved the manuscript. All authors read and approved the final manuscript.